As I sit here playing catch-up with the last few weeks of recipes, I’ve been scrambling around trying to find something to cook and post for you. My seven month old baby is getting over his first cold, and to top things off, he is getting his lower and upper teeth at the same time. It’s been a bit of a whirlwind and I’m a little sleep deprived. With that said, better late than never. 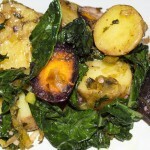 This recipe features caramelized leeks, wilted kale and seasoned, roasted potatoes. I used the Rose Finn Potatoes from the box but you can easily substitute them for a crescent or red potato. 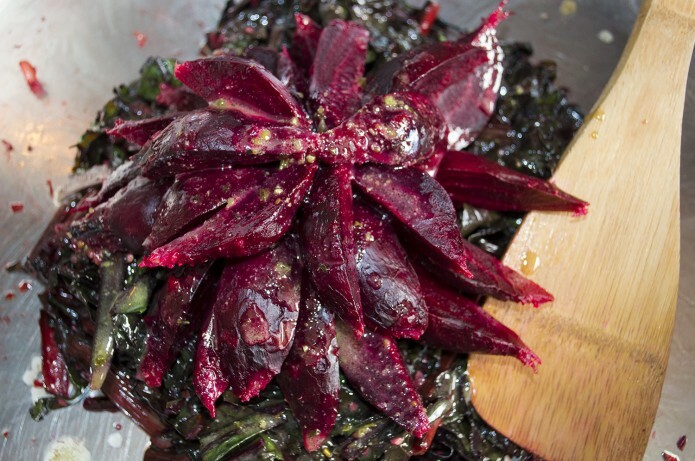 I threw in some of the wonderful purple carrots from the recent farm share which gave the salad a wonderful color and paired nicely with the kale. This dish is both healthy and hearty! Enjoy! Start by making your dressing. Combine mustard, vinegar and lemon juice. Gradually whisk in oil. Set aside. Clean and scrub your potatoes. Keep the skin on and remove any bad spots. Cut into bite size pieces. Clean and scrub your carrots. Keep the skin on to retain the wonderful purple color. Slice into 1/4" pieces. 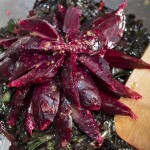 Remove the stems from your kale and roughly chop. 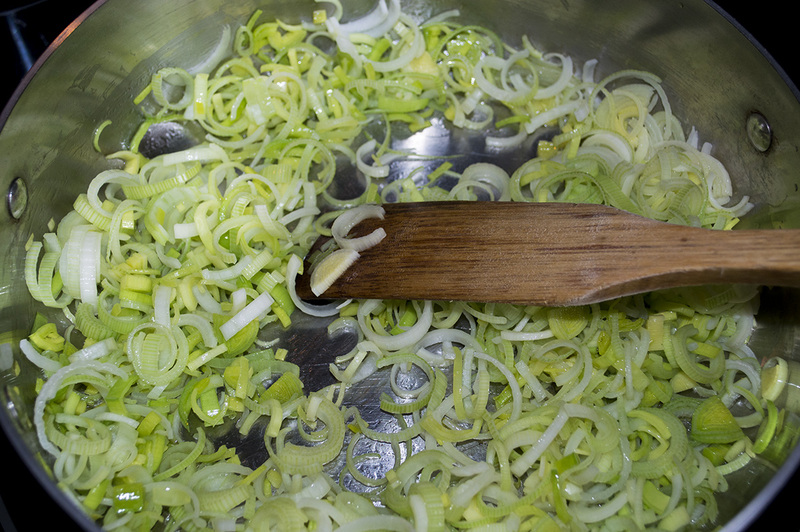 Clean your leeks and slice thinly. Set aside. 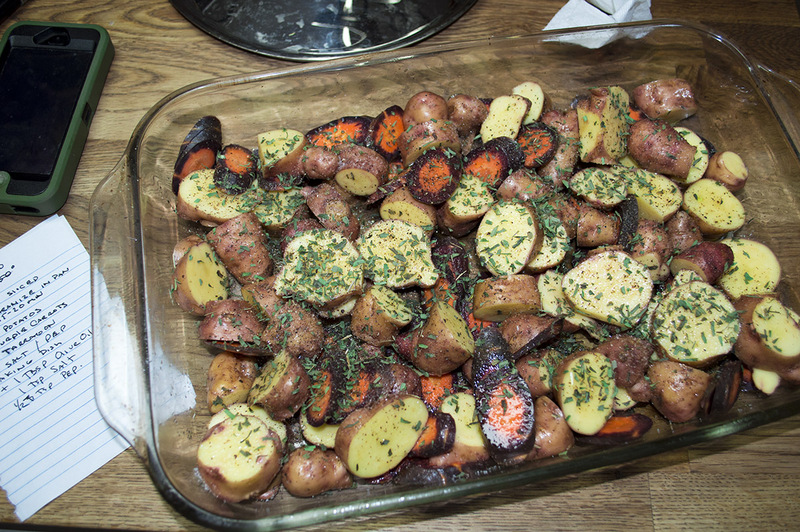 In a large baking dish, add your potatoes and carrots. Toss with 1 Tablespoon of olive oil, 1 teaspoon of salt, 1/2 teaspoon of fresh ground pepper and 2 teaspoons of dried tarragon. Cook for about 45 minutes, turning once or twice to brown evenly. Potatoes are done when browned and crispy. While your potatoes are in the oven start cooking your leeks. In a medium sized skillet, add 1 tablespoon of olive oil and bring to a low/medium heat. 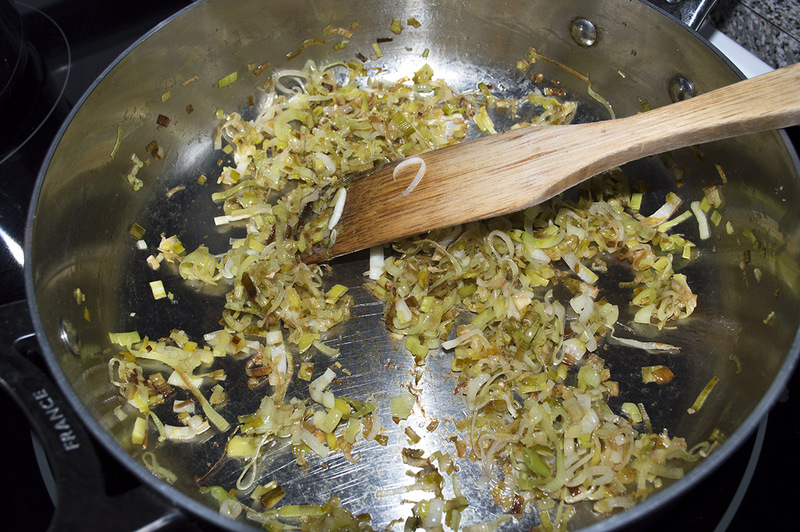 Caramelize leeks by cooking with 1 1/2 tablespoons of extra virgin olive oil for about 20 minutes or until they’re browned. Try not to cook them too quickly or they will burn. 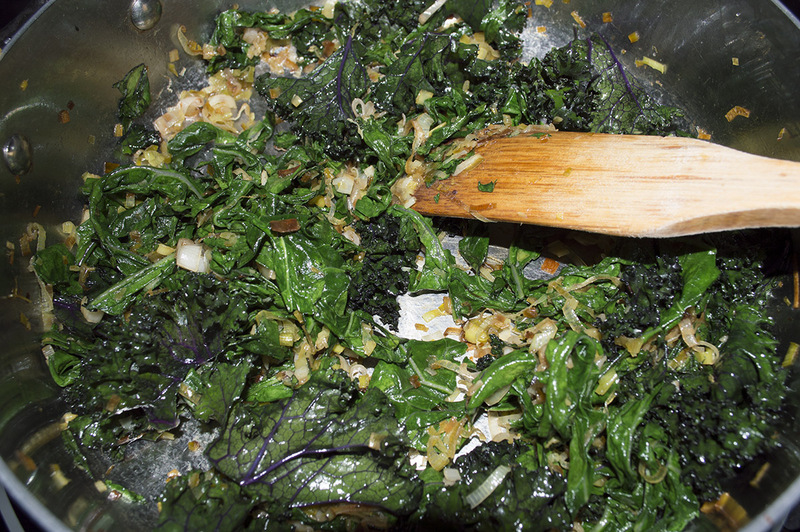 Once your leeks are caramelized, add your chopped kale and crushed garlic. 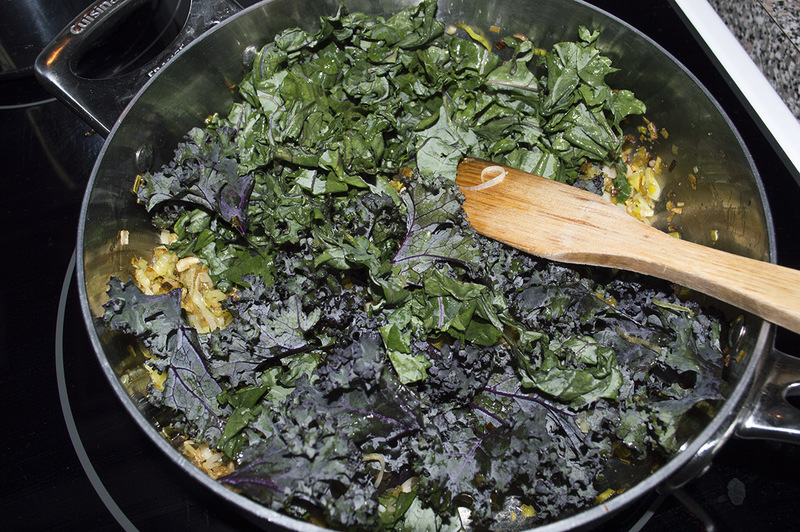 Continue to stir and cook for about 5 minutes until your kale is wilted. Remove from heat and set aside. At this point, your potatoes should be close to being done. 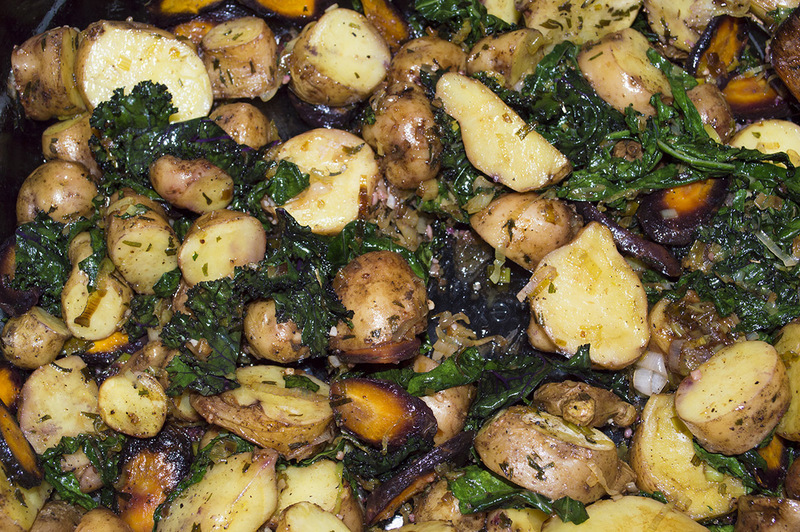 Once they are browned and crispy, remove from the oven and toss with your kale and leeks in the baking dish. Drizzle the dressing on your potatoes that you made earlier. Stir until it's well coated. Serve immediately. This variation of your typical potato salad is perfect for those who are not members of the mayonnaise appreciation committee (myself included).The combination of sweet and salty will certainly be a hit at your next pot luck or gathering and if you’re a fan of apple cider vinegar, this recipe is for you. I’ve always had nightmares of a mayonnaise laced potato salad marinating in the hot sun during a family picnic; by swapping that out with a little ACV certainly curbs those awful thoughts. 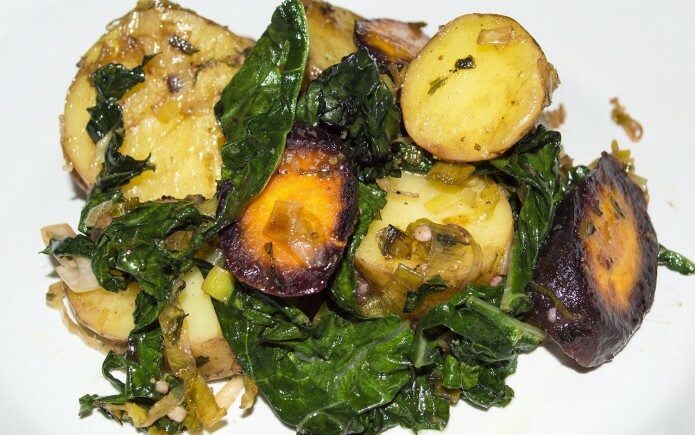 We took last week’s CSA inclusion of yellow potatoes and parsley to whip this one up for you and can easily be converted to a vegan recipe by omitting the bacon and using a little olive oil and smoked paprika to replace the bacon fat. Enjoy! Scrub and remove eyes from your potatoes. Boil until tender but firm. Dice and fry your bacon. Reserve Fat. In a small fry pan, caramelize your onion with the olive oil on low heat for 15-20 minutes until golden brown. In a small pan on low heat, combine apple cider vinegar, bacon fat, beer, sugar, mustard, garlic powder and pepper. 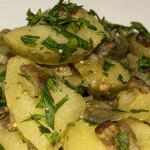 Dice potatoes and combine sauce, onions and chopped parsley in a large mixing bowl. Stir gently until well incorporated. Can be served warm or cold - enjoy!